If you spent your childhood years huddled under the covers with a flashlight and a dog-eared copy of Superman, it’s safe to say comic books are a time machine, transporting you decades back in time with the flip of a page. And from annual Comic-Cons to the super-successful Marvel superhero movie franchises, comic books are back in a big way. More than just nostalgic tokens, their saturated colors and detailed graphics make them eye-catching pieces of art, perfect for displaying. So dust off the collection in your basement and treat a piece of your past to DIY custom framing. Here are some tips from our showroom manager, Lindsey Harrison. 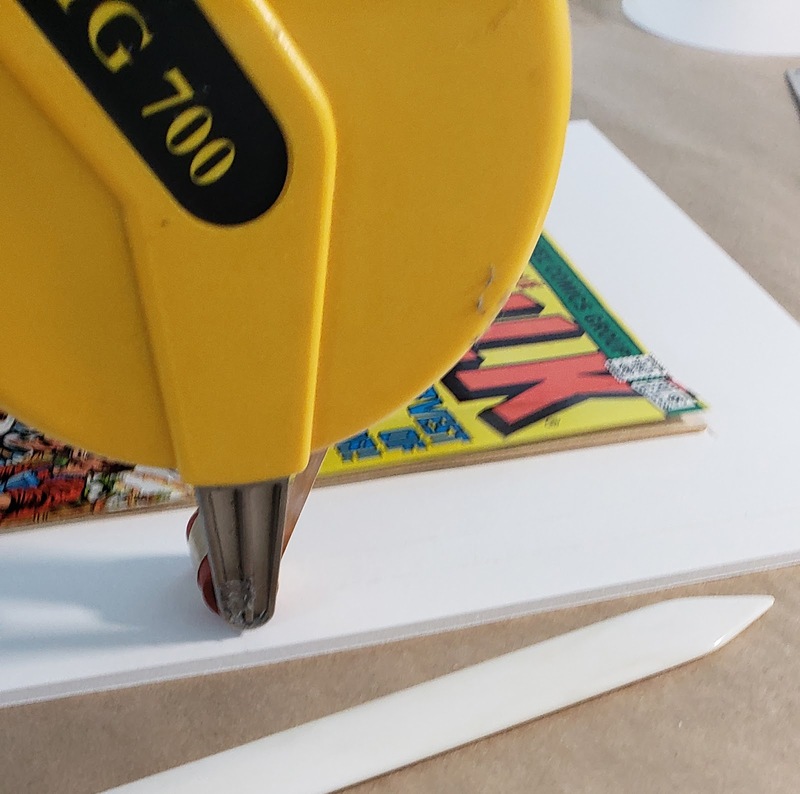 When it comes to something as collectible as comic books, preservation is the name of the game. Older issues can be worth thousands of dollars, while new editions can appreciate in value rapidly. So opt for acid-free materials to keep the paper from yellowing and turning brittle. Any of our Bainbridge mats labeled “ArtCare” will do the trick, as they actively protect against harmful acids and gases from the comic and framing treatment. We also recommend using UV protected acrylic to prevent the paper from weakening, as well as protecting the vibrant colors. 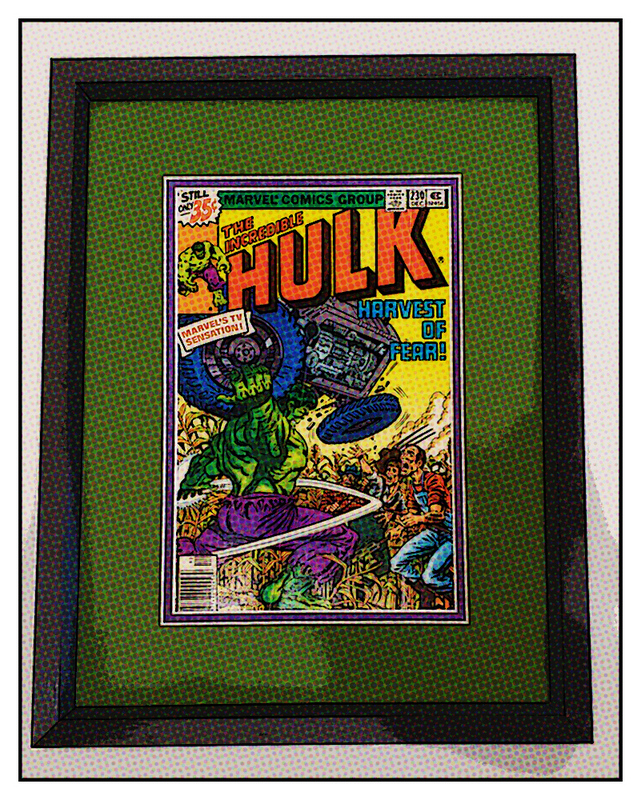 How will you display your comic book? We closed ours and let the front cover take center stage a good option to decrease the risk of damage to valuable books. It’s possible to fold a book open when framing to highlight a certain page, but it could damage the spine. Instead, consider scanning or photographing the page and using our fine art printing services. That way, you can frame your favorite scene, while the original is stored safely away. 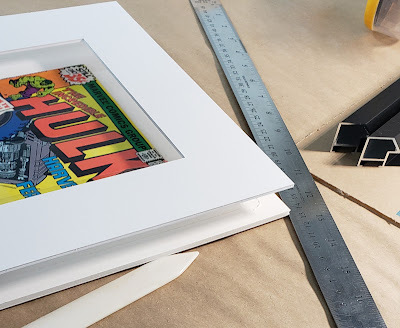 If there’s one place to have fun with your frames, it’s comic books. This is a job for bold colors, like Tornado Red, Galactic Blue, and Cyber Green. Experiment with mat board and frame hues for a look worthy of your favorite caped crusader. For our example piece, we used a Brushed Black metal frame with a Tartan Green mat and an Imperial Plum mat. Once you have the framing treatment and materials picked out, you’ll need to attach the comic so it stays protected and in place. But skip traditional adhesives ꟷ they can destroy the comic. 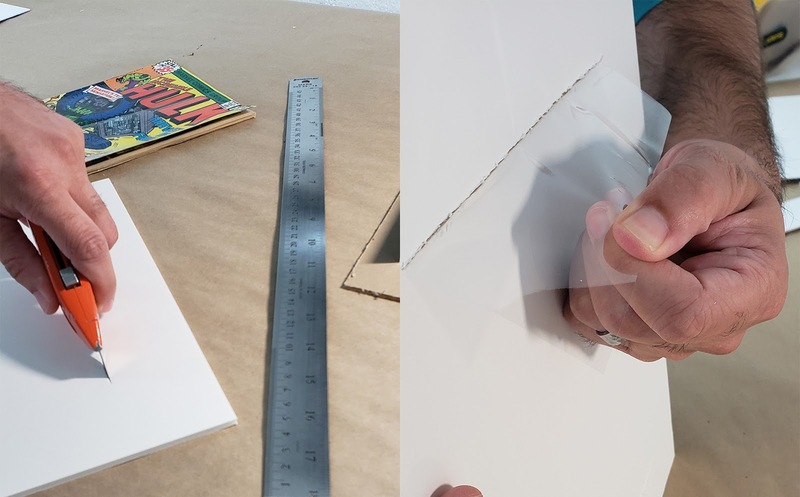 We recommend using a strip of acid-free mylar cut a few inches longer than the height, and a few inches shorter than the width of the comic. Wrap the strip around the height of the comic, behind the inside cover. To attach to the mounting board, cut slits into the board directly above and below the comic and slip the mylar through that, and secure it to the back of the mounting board using acid-free tape. That should keep the comic in place and prevent shifting. 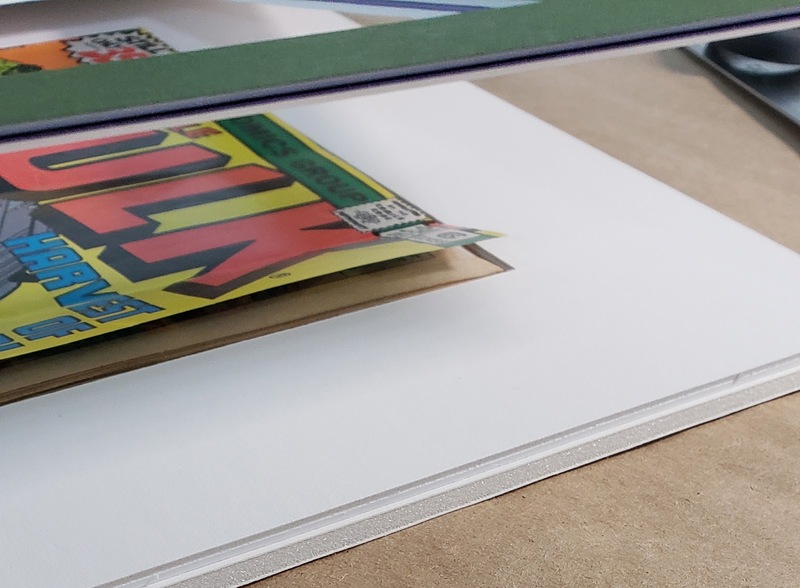 Since the comic book is thicker than the mat itself, a mat build-up will be necessary to support the comic and prevent sagging. Depending on the thickness of the item, you can complete this with strips of archival foam core or mat board. 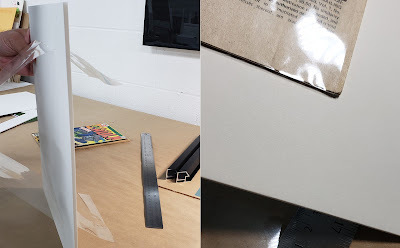 The comic book in our example is the thickness of two 4-ply mat boards, so we cut our strips, attached them with acid-free transfer tape, and fastened them to the mounting board. Show us your comic creations. 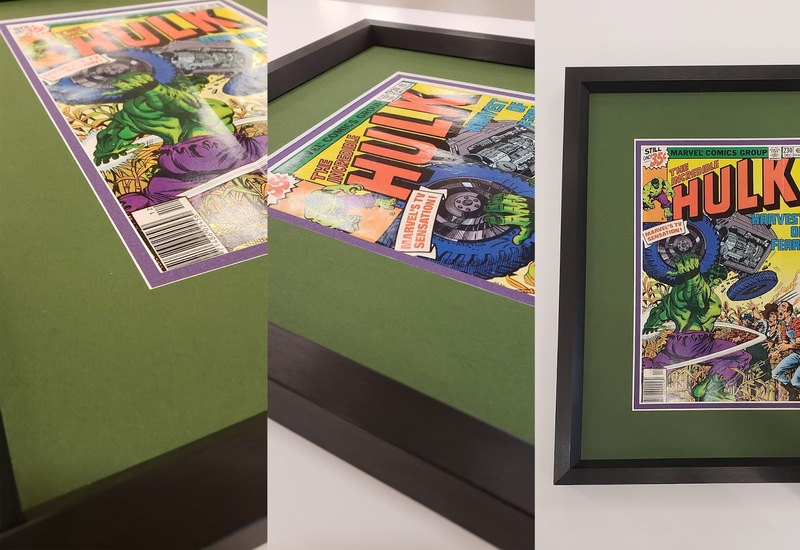 Tweet photos of your framed comics to @AmericanFrame using #AmericanFramed or email it to Customer.Service@AmericanFrame.com. 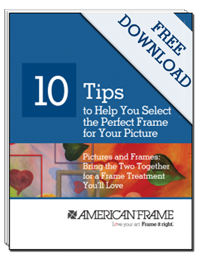 Have framing questions? Our experts are here to help. Contact our customer service experts. For tips and exciting offers, sign up for our e-Tip newsletter. Your frame selection is quite meticulous, I find you very strict in the frame selection.